Another amazing Sunset Music Cruise with three boats rafting up – Fantasia, Epiphany and Freedom Kirkland. 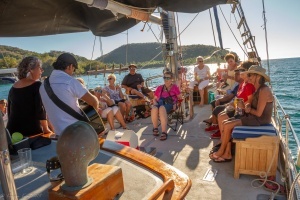 We were entertained by Juanito Zihua and Michelle Lavallee before heading out of the bay to catch the sunset. We even had an adventure when we rescued a Hobicat and towed it back to La Ropa beach. All in a days work for Por Los Ninos Sailfest!